There are a variety of gold coins in South African that have been issued by the South African Mint for several decades now. They come in a variety of gold karats and also of weights which makes it easier for a prospective buyer to choose the specific coin which will suit with his buying capacity. The most famous of these gold coins being the Krugerrand, which has also been issued in several commemorative sets and also in varying weights. They also have gold coins that showcase their famous animals and also plants and also some of them were produced to commemorate famous sports events and personalities. The variety will definitely suit different tastes and needs for gold coin collecting. 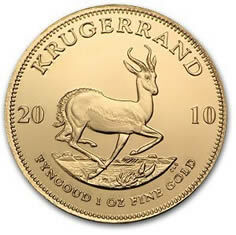 The Krugerrand is the most famous of all the South African gold coins that were issued by their mint. It is made from a more durable 22 karat gold mixture. These coins are packed in special cases depending on what you would need and also comes with their own certificates of authenticity. You can buy them either in bullion form or in the proof form which will cost you a lot more. It contains an exact one ounce of gold although its total weight is a little more than that. Aside from this coin, there are also several other gold coins that were issued by the South African Mint such as the Burgersponde, which was created in 1874 in order to commemorate the discovery of gold in a new site in Africa. There has also been a collection of coins which were struck in the Mint which was similar to the coins of Great Britain in 1891. They consist of the pound, half pound, the crown, and the penny which was all issued in limited numbers making them quite a set to collect. There is also the Sammy Marks tickey which was issued on 1898 when Sammy Marks was given the privilege of using the government mint for one day. This coin is made from 22 karat gold and only 215 pieces were made. There is also the 1898 Pond coin which has features two nines instead of the one large nine which is the original design for the coin. You can also choose the Protea set coins which depict the famous flower of Africa, the protea. Aside from this, the coin also contains some major events in African history on its reverse. It is a good piece if you are interested with coins depicting famous historical events since the coin features a different event in each new issuance. The coin has featured Nelson Mandela and the Archbishop Desmond Tutu to commemorate the great influence that they had in the making of the history of Africa. There is also the Natura coins which depicts some of the largest animals in Africa such as the Eland, the Hippopotamus, the Lion, the Gemsbok, and the Rhino. These animals are considered as the best in Africa and hence were chosen to represent this particular set to show the greatness of Africa.